". . . Then we found Dragonmobility"
My son Aiden is 7, a big 7 and excessively strong. He has QuadriplegicCP with virtually constant patterns of hyper extension through his back, legs and arms. We've been told since he was 2 years old by the NHS that he was the "hardest child they have ever had to seat". He is very social, very chatty and other than the severe movement complications has no learning difficulties at all. We were very anxious to get him a power chair to allow him the independence we felt he deserved but were told by both the NHS and other power chair companies that it would be impossible to seat him and he would not functionally able to drive a power chair. Then we found Dragonmobility - over many months of visits to the Dragon workshops they did the most amazing job in customizing the chair to fit his needs completely. On reflection I think we stretched them to the extreme but they responded with unbelievable patience, understanding and skill and a desire to help Aiden achieve his independence. Once we had the chair, and because of Aiden's poor motor control it has taken him a long time to get the hang of driving it safely and not into everyone! Now he can drive it, it has changed his life. Aiden has very strong hyper extension but in the SnapDragon this hardly seems to bother him. He extends less, and certainly with less force. The articulated footplate seems to absorb his extension spasms - as his feet and legs are able to move forward instead of being fixed (other than to the foot plate) when he extends the spasm comes down through his legs and not up through his body, so it is far less intrusive on his upper body posture than when his feet are in a fixed position. 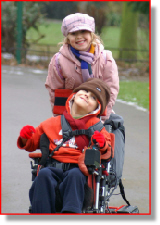 The moving footplate of course allows the chair to go right down to the floor and the child's legs can slide forward but when in a normal sitting position it allows this flow of movement, and is wonderful for children with extensor patterns. Personally Aiden is far more comfortable in his SnapDragon than in other chairs and certainly for extended periods of time. We were at a family wedding recently and Aiden had to be in his SnapDragon at 9am and he was still on the dance floor at 10pm! As for service from Dragon we couldn't ask for more. We are lucky to only be about an hour away and so are able to make frequent visits - however if we have needed something urgently they have posted it to us and we have received it the next day. They have always been available on the phone if we have needed advice and generally I cannot fault their after sales service. With regard to being able to use it for sitting at low desks etc I would say a SnapDragon is essential - not just from a logistical point of view but essential in terms of physiological development. A child needs to be able to sit on the floor and play with toys, sneak under the table and play hide and seek, sit with the other children at circle story time, peek over the worktop while you cook, and squeeze into a twig wigwam with the other children. These are all things that Aiden has now been able to do, on his own, because of his SnapDragon. Things we thought he'd never be able to do - It's allowed him to be more how a child should be and that's something money can't buy.